YOU… if you win one of the first SMART EGG COMPETITIONS this summer! 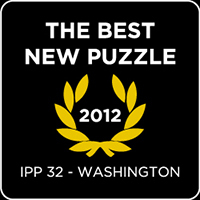 This puzzle won the Grand Prix Award, the Jury Grand Prize at the World Puzzle Championship 2012 in Washington. Only one correct path through the Egg connecting the top with the bottom!